Uncategorized | WHAT A FEELING! 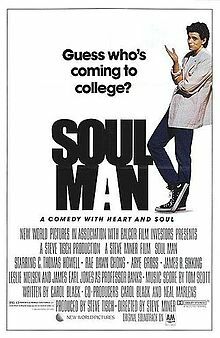 By now, you’re probably familiar with the high-concept idea behind Soul Man, but just in case you missed it, we’ll recap: A jerky white kid (C.Thomas Howell) gets accepted at Harvard Law School and sees a fat future in front of him. Then his rich daddy (James B. Sikking) cuts off the boy’s allowance, which means the kid must find his own method of finance. So Howell takes these handy extra-strength tanning tablets that turn his skin deep brown, and he perms his hair. And he’s in Harvard. This concept may sound distasteful, and, well, that’s about how it plays. The makers of the film, writer Carol Black and director Steve Miner, clearly mean it to be taken as an anti-racist film. Howell sees the racial prejudice directed at him, grows up a little bit, and falls in love with a fellow student (Rae Dawn Chong) who happens to be black. Most of that doesn’t wash. The intentions may be right, but most of the film is callous buffoonery, and a trivialization of its subject. Late in the film there’s a farcical scene in which Howell’s parents come to visit from Los Angeles the same time his two girlfriends show up. It’s a well-managed scene; too bad the rest of the movie doesn’t have the same snap. James Earl Jones does a John Houseman number as the tough law professor; it’s an unbearably hammy performance that culminates, in the film’s queasiest scene, with Jones admitting that Howell might really have learned a lot about the black experience. This is a little hard to believe. The only notable performance, outside of Chong’s appealing professionalism, is given in a very small role by Ron Reagan (not to be confused with the other actor who has that name). Young Reagan is as relaxed and convincing here as in his occasional TV appearances, and gives every indication that he might be a likable future player. That small bright spot aside, Soul Man is a pretty negligible affair—and the title is the essence of irony. This is a film that might have a few laughs, but it’s certainly got no soul. I completely forgot that Ron Reagan ever took a stab at acting, let alone that I wrote of his work approvingly. Howell and Chong later married. Carol Black was one of the key people behind “The Wonder Years,” which leads me to suspect there might be more going on in this movie than it seemed at the time, although I clearly didn’t hate it. The Delta Force is two films laid end to end. For its first 45 minutes or so, it depicts a plane being hijacked in Athens and flown to Beirut and then Algiers. The emphasis is on the terror of the passengers and the brutality of the hijackers. For the remaining hour and 15 minutes, the adventures of the Delta Force, a crack American military rescue unit (if you couldn’t guess) take center stage, so that the hostages are pretty much forgotten about until they’re rescued. This second half is normal, perfunctory blood and guts stuff, with Chuck Norris and Lee Marvin leading the exploits and dodging the bullets. It’s about what you’d expect, especially from a Norris picture. It’s the first section that’s unusual. The hijacking is obviously based on last year’s Beirut hijacking, including the hostages being sequestered in Beirut, the pilot giving an interview at gunpoint, and the gutsy blond stewardess. What the film makes explicit is the idea that the hijacking in The Delta Force represents a return to concentration-camp mentality, because the Jewish passengers are singled out for brutality. One of the passengers (Martin Balsam) is, in fact, a camp survivor, and his wife (unfortunately played by Shelley Winters) screams that the passengers must resist, not go along with the terrorist demands. And there’s the German stewardess (Hanna Schygulla) who is haunted by the horrible irony of her having to select Jewish-sounding names among the passengers. These sequences make for unexpected tension, somewhat undercut by the overly emphatic direction and the built-in campiness of the casting, which has Winters, Joey Bishop (who intones sadly, “Beirut was once the Las Vegas of the Middle East”) and George Kennedy among the passengers. Still, it’s effectively creepy. Then Norris and Marvin kick in, and the ammo starts flying. If anybody knows how to mix it up, it’s these guys, and the film delivers jolt after jolt of cathartic boom-boom as the rescue mission continues. It’s got a zillion lapses in credibility, and the mission as we see it is nothing but incredible. But that certainly didn’t bother the foot-stamping crowd at a weekend matinee. 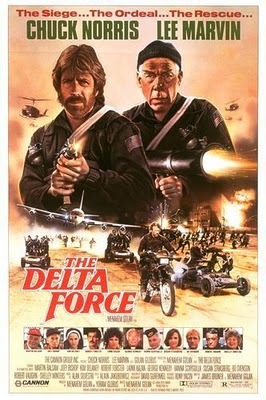 The Delta Force is the most recent product of the prolific Cannon Films, which specializes in Norris movies, Ninja films, and the occasional bid for respectability (Runaway Train and the upcoming Fool for Love). It’s run by two Israeli moguls, Yoram Globus and Menahem Golan, who set up shop in Hollywood a few years ago and have been churning out successful movies since. 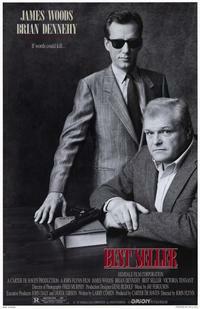 They also take occasional screenwriting and directing credits. Golan co-wrote and directed The Delta Force, and the victimization of the Jewish passengers and this hostility of the Arab terrorists obviously makes the film more important to him than the usual shoot-’em-up. This angle makes The Delta Force the year’s most unlikely message movie. A strange concoction. You might actually miss the fact that Lee freaking Marvin starred in this movie (his last, alas), but when it registers that he’s taken second billing to Chuck Norris, you have to weep a little. The cast included Lainie Kazan and Susan Strasberg, with Robert Forster as Abdul. (And, according to IMDb, Liam Neeson as a Delta Force member.) And yes, there was Fassbinder icon Hanna Schygulla, occupying the most interesting section of the film.